The call is open to young women professionals, master students, PhD researchers and Postdoctoral fellows from the scientific and technical areas. AMIT-CAT will select the candidates, and the chosen ones will become ambassadors of the project. They will be responsible for delivering informative talks to secondary school students (2nd and 3rd ESO) in Catalonia. Their mission is to pesent their professional activities and/or scientific research, motivations and future expectations, incorporating the gender dimension in the talk, to raise awareness that being a woman cannot be a barrier to their professional success. 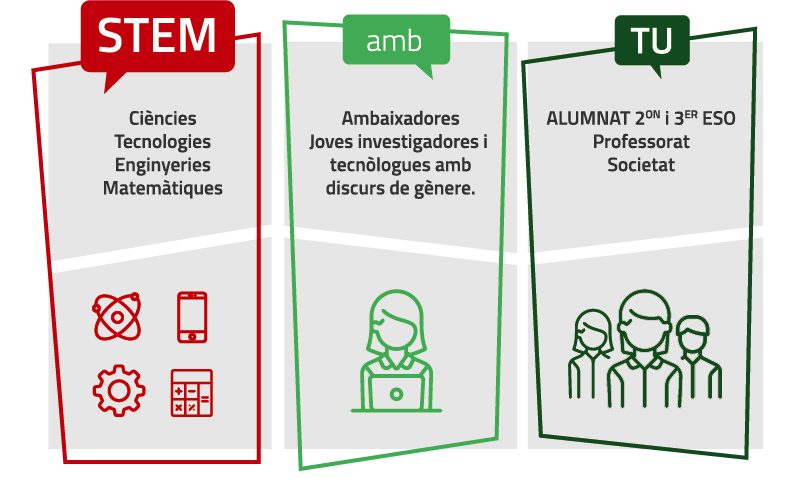 "STEM AMB TU" aims to make three elements visible: the scientific and technologic women, the gender bias in our society with its causes and consequences, and the promotion of STEM among girls as exciting and future professions. Ambassadors will receive gender training, oral communication skills training, and a financial aid in exchange for their work. In addition, they will become members of AMIT-CAT (first year free of charge). The secondary schools that are interested in receiving a talk of the project "STEM AMB TU" may request it from June to September 2018 through ICE/UAB. Priority will be given to centers based on the geographical area in order to be present at the entire territory; and to those centers that organize the activity for more than one class or course and/or in those that the talk is part of the school STEM promotion activities. From ICMAB, we support this initiative and we would like to encourage our Master students, PhD researchers and postdoctoral fellows to participate in it. We think that it will have a positive effect, both for the young women who will be trained and that will deliver the talks, and for the students who will have the opportunity to listen to them in their own schools. Open call for ambassadors here.